With War of the Spark spoiler season in full swing, we’ve seen a torrent of new cards – including plenty of planeswalkers. While there’s plenty of room to brew new decks, I can’t help but wonder how they’re going to slot into the current Standard metagame. Teferi, Time Raveler is the most obvious inclusion on this list. Being able to curve from Time Raveler into Teferi, Hero of Dominaria in a control mirror will most likely spell defeat for your opponent. In fact, a resolved Teferi, Time Raveler will probably be game against any grindy matchup, where opponents will have to cast their Vraska’s Contempts at sorcery speed. Plus, if your opponent can deal with your Ixalan’s Bindings, you now have a way of returning them to your hand. While Teferi is a natural fit for Esper Control, decks like Azorius Aggro can also take advantage of it to keep Control decks from casting counterspells. While the +1 is far less relevant in a deck that plays so few sorceries, being able to rebuild after a board wipe by returning your most powerful creatures back to your hand can give aggressive strategies additional reach. Speaking of aggressive strategies, The Wanderer is another interesting sideboard option for Azorius Control (or any deck playing white, really). Mono-Red’s popularity shows no sign of waning, and The Wanderer protects you and all of your creatures from being Skewered. With five starting loyalty, it’ll take at least two burn spells to take The Wanderer down. Plus, with more Gruul strategies popping up, The Wanderer’s minus ability becomes a valuable answer to Skarrgan Hellkite and Gruul Spellbreaker. On the flip-side, lifegain with cards like Lyra Dawnbringer and Wildgrowth Walker has always been an effective way to counter aggressive strategies. Tibalt, Rakish Instigator takes Rampaging Ferocidon’s place (we miss you, little dino), turning off opposing strategies to climb back from low life totals. Even blanking lifegain for a turn or two is likely enough to close out the game with burn spells, so don’t underestimate Tibalt. 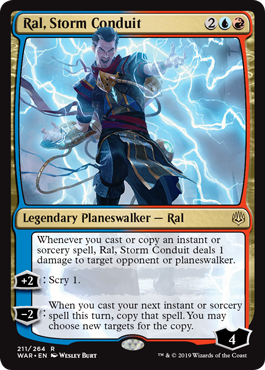 Ral, Storm Conduit looks like a good fit for Temur Reclamation or Izzet Phoenix/Drakes decks. While he combines particularly well with Expansion // Explosion, he can easily close out games on his own with the right combination of spells. Another great three-mana inclusion, Vivien, Champion of the Wilds merits testing in Golgari, Sultai and Gruul midrange lists. Vivien Reid has already demonstrated the value of digging for creatures late in the game, and being able to give those creatures flash can turn the tide against many an opposing creature-based strategy. Both Ajani and Jiang Yanggu have counter synergies that could make for some explosive starts. I think both of these planeswalkers could easily slot into existing GW tokens strategies, alongside “go-wide” cards like March of the Multitudes, Emmara, Soul of the Accord and Trostani Discordant. Additionally, Ajani’s minus ability gives Jiang Yanggu additional longevity, letting you tick down two or three more times than you would have otherwise. While Rakdos or Mardu Divas were all the rage at the beginning of the last Standard season, the deck ended up feeling clunky and often came up short. Angrath, Captain of Chaos and Tibalt, Rakish Instigator could provide the deck with the extra reach and evasion it needs to be propelled to Tier 1. With even more planeswalkers coming soon, I’m excited to see what more could be in store for the new Standard season. Which planeswalkers are you most interested in? Let us know on Twitter at @Card_Kingdom! A Spike at heart, Chantelle spends her free time prepping for tournaments, working toward the ever-elusive Mythic Championship, and championing other competitive ladies. She’s a combo aficionado and seasoned aggro deck player, and Standard and Modern are her preferred formats. Growing and improving as a player, both technically and in her mental game, are of the utmost importance to her.